Conversation was irrelevant. Only pie mattered.If you have not read the Vampire Academy series, I'd suggest you read part 1 of this review and stop there, or you will have VA spoiled for you (Bloodlines is a spin-off). If you have not read VA, then you are free to picture me scowling at you. Vampire Academy : Blood Sisters is going to be a movie soon, so get on it! Before you ask, don't even blaspheme my review by trying to compare this to Twilight. It's not the same. At all.Why the random pie quote from this book? Because Mead is like comfort food to me and that's why I keep coming back. Since we're at book 3 already, I can't sell you on this series by telling you what the book is about. So instead, I'll give you a taste of why I love this author. 1. She writes great characters. I can't help but fall in love with each and every one. Yes, the guys are swoon-worthy, but the females are pretty badass too!2. She writes great concepts. While I'm not as big of a fan of the magic training in this series as I was the fight training in VA, one strength of Mead as an author is that she brings something new to the table every time.3. She writes a great balance of action/adventure and sexual tension. I can admit to being girly and liking some romance but my favorite books bring it in other areas too. 4. She's funny. I laugh with each and every book. He was distracted by a lot of things. Fondue. T-shirts. Kittens.I certainly hadn't expected to walk away from today's trip with joint custody of a miniature dragon.The future of our relationship hinged on advice from a fifteen-year-old girl, a probably untrue story from a one-eyed Chihuahua trainer, and me unromantically kissing you on top of silverware and china?Love. That is all. On to the second part of my review. "Just walking Miss Sage back. She had to get something from her room. "Pete looked dazed for a moment. Then he nodded in understanding. 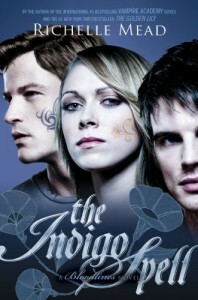 "You compelled him," I whispered, once we were safely out of earshot.For some reason, that scene reminded me of Star Wars and the "these are not the droids you're looking for" scene, which put a smile on my face.This is the part of the review for people who have read The Indigo Spell, or at least have started the Bloodlines series and won't mind my minor spoilers. If you haven't gotten here yet, BACK AWAY! It's not really going to be much of a review from here on out anyway. I just need to ramble on some points. *waiting for people to exit so I can get ranty*Sooo.... Adrian. You all can get angry at me if you like but it's bugging me how the word primal keeps getting used to describe him in this book. He acted primal, he had a primal instinct, etc. NO. JUST NO. Primal is what I have called Dimitri all along. In fact, I nicknamed Strigoi Dimitri - "Primal Dimitri." If you don't believe me, check out my review for Blood Promise. I don't care if Adrian's somehow morphing into this protective guy who will fight for the girl he loves...oh wait, I do care because he didn't do that for the "other" girl he claimed to love. Out of character, what? Yes, I get that he technically might not have loved that other girl. But the point is that he was willing to risk getting in trouble and other things for her when he believed himself in love with her. But now he will fight? Fine, go ahead and argue that they took a class. Pfft.Is anyone else sort of bored with the magic training? No? It's just me? I like fight training better. I did laugh when Sydney remarked that she'd downloaded the 'bad boy book' online. The dream scenes were hot. Those were some of my favorite VA scenes, so I'm glad to see more of them. And I did crack a smile when Adrian talked about how he liked White Russians, given his personal experience with Russians. They're surprisingly delicious! Haha. ...and there's my sloppy end to part 2. Told 'ya it was just gonna be rambling. I'd love to see thoughts/agreements/disagreements about my disgruntlement with the direction they've taken Adrian. Don't get me wrong, I still love him. But I don't think he needed to be 'that' in this story. We loved the other guy because he could do this. We loved this guy for other reasons.